Back To The Kitchen: For The Love Of Chocolate! Oh chocolate! My true love! How many nights it has been you and I! The evening ends with me beating myself up after hours at the gym and then the sun goes down and I just can’t resist you! Who knew we were doing something so terribly right! Dark chocolate has been shown to reduce LDL levels (the bad cholesterol) by up to 10 percent and it contains phenylethylamine which is the chemical the brain produces when we fall in love. It contains neurotransmitters that act like little messengers running around our brain telling the body what to do. Serotonin, one of the main neurotransmitters in the body, acts as an anti-depressant. Chocolate has antioxidants. Antioxidants neutralize free radicals, which damage cells, clog arteries, and contribute to chronic illness and aging. It contains more calcium than eight ounces of milk and it is full of flavonoids which are pigments found in plants that help reduce damage to the body. They help relax blood pressure through the production of nitric oxide and are good for the heart. It releases endorphins that are natural feel-good chemicals. It just makes you feel good! So grab a slab and enjoy guilt free these recipes! Once again chocolate is our friend! Place chocolate in heatproof pan. Fill a medium saucepan with a couple inches of water and bring to a boil over medium heat. Turn off the heat; set the bowl of chocolate over the water to melt. Stir until smooth. Once the chocolates are melted and smooth, remove from the heat. Line a sheet pan with parchment or waxed paper. Holding the strawberry by the stem, dip the fruit into the dark chocolate, lift and twist slightly, letting any excess chocolate fall back into the bowl. Set strawberries on the parchment paper. Repeat with the rest of the strawberries. 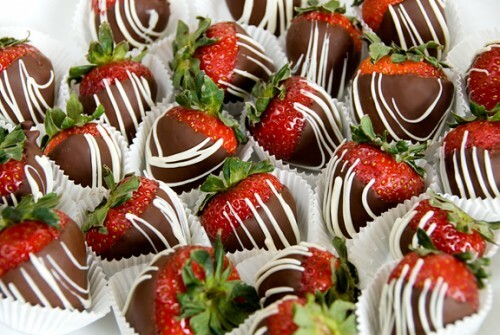 Melt the white chocolate the same way and with a fork drizzle over half of the strawberries for a lovely presentation. Mix butter and olive oil in a stockpot over low heat until butter is melted. Add onion and a pinch of salt. Stir until onion is translucent. Add garlic and stir for about a minute. Add rice and stir a few minutes. Add mushrooms and stir for about 5 minutes until they soften. Add wine and stir until absorbed. Add hot stock about ½ a cup at a time. Keep the heat hot enough so the rice keeps gently simmering and absorbing each addition of stock. When the rice is plump and cooked when tasted you have added enough stock. Stir in 1-tablespoon cocoa and dash of paprika. Taste and check seasoning. Stir through some parsley and Parmesan. Sift together cocoa, flour, sugar, baking soda, and salt into a large bowl, then whisk in eggs, yolk, buttermilk, oil, and vanilla until combined well. Heat a griddle or nonstick skillet over moderately low heat and lightly coat with butter. Working in batches of 2 or 3, pour 1/4 cup batter per cake onto hot griddle and cook until bubbles appear on surface, 1 to 2 minutes. Flip cakes with a large spatula and cook until tops spring back when pressed gently, about 1 minute more. Transfer to a plate and loosely cover with foil to keep warm. Add 1/2-teaspoon butter to griddle between batches. Serve cakes in stacks, topped with chocolate sauce. Bring cream to a boil in a 1-quart saucepan, then pour hot cream over chocolate in a bowl, gently whisking until smooth. Keep warm or at room temperature. In a medium saucepan bring cream and butter to a boil and stir in tealeaves. Remove from heat and let steep 5 minutes. Pour into a fondue pot and serve with shortbread, pound cake and any fruit you like. In a medium pot heat 1 cup of heavy cream with cocoa; whisk well to ensure the cocoa dissolves properly. When cream is bubbling at the edges, remove from heat and add dark chocolate. Wait 30 seconds then give it a good stir until it’s all incorporated. Add remaining cup of cream to pot, stir to combine, then pour the contents into a medium sized non-metal bowl, scraping out the pot as well as you can, and place a strainer over the bowl. Place the pot back on the stove, and add the cup of milk, 1/2 cup of sugar and the salt. Heat the milk and sugar gently on the stove while you get your egg yolks ready. Whisk the egg yolks together and then grab the pot from the stove. SLOWLY drizzle warm milk into the egg yolks, whisking the entire time until everything’s all combined. Then dump the liquid back into the pot. Stir constantly with a wooden or other heat-safe spoon or spatula over medium heat until the eggs thicken a bit, into custard. You’ll know it’s done when you can hold up the spoon and run your finger through the egg-milk mixture and the line you drew with your finger stays there. Pour custard through the strainer into the bowl. Add vanilla and stir to combine the chocolaty goodness. Place a piece of plastic wrap over the bowl, literally touching the entire surface of the ice cream base. Refrigerate for at least 6 hours then prepare according to your ice cream maker’s instructions. Once you’ve got it into your final container, freeze again for at least 6 hours – Remove from the freezer 10-15 minutes before eating so it has time to soften a bit before serving. Preheat oven to 350°F. Spray a 9-inch round cake pan with Bakers Joy. Place the sugar and basil in a food processor. Process until basil is chopped fine and uniformly green in color (it will look slightly wet). In a large bowl whisk the melted butter, cocoa powder and basil sugar until well blended. Whisk in the eggs, 1 at a time, until blended and smooth. Stir in the baking soda, vanilla, and salt. Gradually add flour to bowl, stirring just until blended (do not over stir). Add hot water to mixture, stirring just until blended. Add chips. Pour batter into prepared pan. Bake 22-25 minutes or until a wooden pick inserted in center comes out clean. Cool 10 minutes on a wire rack. Sprinkle with powdered sugar. Cut into squares. Cool completely, Prepare sour cream frosting. Spread over cake and garnish with basil leaves. In a medium bowl whisk the powdered sugar and cocoa powder; set aside. In a separate medium bowl beat the butter and melted chocolate with an electric mixer on low speed until blended. Gradually add sugar mixture to the butter mixture, beating at low speed until well blended. Add vanilla and beat well for 1 minute until very smooth and creamy.